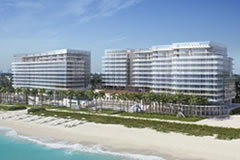 Our clients look to acquire Miami luxury real estate. Given that they come from all parts of the world we find it useful to provide a general overview of the Miami luxury real estate market. Miami is a market with approximately 1,700 sales per year in the $1 to $3M price range, close to 300 properties in the $3M to $10M range and, around 25 residences in the over $10M category. The split between condos and houses is split quite evenly. For every 10 condos sold there are 8 homes sold in the $1M to 3M price range; in the $3M to $10M range for every 10 condos there are 11 houses. Even the +$10M is seeing quite a few condos sell in this price range. 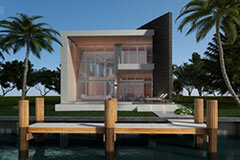 When we talk about Miami luxury real estate, condos in the price range above $500,000 are mainly waterfront properties. Of the approximately 3,000 condos (excluding pre-construction sales) sold on an annual basis, 85% are waterfront properties. Note that this does not mean that the residences will have waterfront views but that the building abuts water. We can only start talking about luxury homes in the $1M price range. There are around one thousand transactions a year in the $1 million-and-higher price range. As you would suspect the higher you go in price the higher the proportion of properties that are waterfront. In the $1M to $3M price range 20% of homes are waterfront. At the $3M to $10M price already 70% is waterfront. Price differentials for Miami Luxury real estate. In general terms, condos in the price range between $1M to $10M are 50% more expensive on a price per square foot basis then single family homes. Also, you will pay between 30 to 65% more for a waterfront property than a non-waterfront property (e.g. a 3,500SF waterfront condo will be 30 to 65% more expensive than a 3,500SF non-waterfront condo). What you can purchase for a certain budget is best established by using the Search Engine in our website. You will be able to determine where the properties with your criteria are mostly concentrated, how much square footage you can purchase and view general condition, quality and finishes of property (through the pictures of residences). However, nothing beats consulting a specialist in Miami Luxury real estate with your specific needs. So call us at 305.864.3100 or Email Us with your specific need. Click Here to Learn More About Us. Interested in selling and would like a market valuation? Click Here for a Fully Automated Market Valuation Online or call us at +1.305.864.3100 or fill out this Contact Form and we’ll do a no-pressure fully customized, more comprehensive market valuation. Constec Realty is the top luxury and ultra-luxury boutique Miami Real Estate brokerage. Full service support for exclusive clients seeking to buy Miami Beach waterfront Condo, Miami Beach Home or other Miami luxury real estate.